WASHINGTON D.C., United States of America, April 5, 2016 – An International Monetary Fund (IMF) team, led by Laure Redifer, visited Kigali from March 22–April 5, 2016 to carry out discussions with the Rwandan authorities on the fifth review of their economic and financial program supported by the IMF’s Policy Support Instrument (PSI), and to reach understandings on economic policies that could be supported under the IMF’s Stand-by Credit Facility (SCF). “The IMF team reached staff-level agreement with the authorities, subject to approval by IMF Management and the Executive Board, on policies that could support completion of the fifth review of Rwanda’s PSI-supported program, as well as a new agreement on an 18-month arrangement under the Fund’s SCF. The Executive Board meeting is tentatively scheduled for May 2016. “Rwanda’s economic performance in 2015 remained robust, with GDP growth of 6.9 percent. Growth in 2015 was buoyed by strong construction and services activity, with agriculture and manufacturing also performing well. Consumer price inflation remained contained, averaging 2.5 percent for the year, though it increased in the second half of 2015 due to higher food prices and administrative price increases. In February 2016, prices were 4.4 percent higher than a year before. “However, new challenges emerged over the course of 2015 as a result of global developments. Lower prices and demand for Rwanda’s minerals almost halved the country’s mineral exports, leading to a significant loss of export revenue. This was exacerbated by lower-than-projected inflows of private capital and remittances, which together led to downward pressure on the Rwandan franc and foreign exchange reserves. “Despite these developments, macroeconomic policy performance through end-December 2015 remained in line with program objectives. Most quantitative targets were met, and were supported by structural reforms, notably changes to boost domestic revenue collection, reduce liquidity overhangs, strengthen financial market supervision and functioning, and improve domestic revenue collection. Planned measures to revise the law for property taxes and improve the timeliness of public reporting on budget execution are taking somewhat longer than originally anticipated. “Over the medium term, growth prospects remain in line with Rwanda’s high potential, and the mission welcomes ongoing initiatives to promote export diversification and encourage local production of what Rwanda currently imports, in order to improve Rwanda’s resilience to external shocks. These policies will, however, take time. In the near term, more immediate measures are needed to deflate external pressures and stem the drop in foreign exchange reserves. The mission welcomes, therefore, the authorities’ commitment to implement more cautious monetary policy and postpone some non-priority public spending to help dampen still-strong demand for imports. Allowing the exchange rate to continue to adjust as necessary will be critical in this regard. The mission expects that successful implementation of these policies will maintain economic growth at around 6 percent, while keeping inflation below 5 percent. “The mission commends the authorities for decisive economic policies aimed at safeguarding external sustainability and reinforcing Rwanda’s long-term development potential. The mission also welcomes the authorities’ ambitious program of supporting forward-looking policy reforms aimed at strengthening the efficiency of public spending; and improving tax compliance. Rwanda’s PSI was approved by the IMF Executive Board on December 2, 2013 (see Press Release No.13/483). The PSI is an instrument of the IMF designed for countries that do not need balance of payments financial support. The PSI helps countries design effective economic programs that, once approved by the IMF’s Executive Board, signal to donors, multilateral development banks, and markets the Fund’s endorsement of a member’s policies. Details of Rwanda’s current PSI are available atimf.org/rwanda. The SCF supports low-income countries that have reached broadly sustainable macroeconomic positions, but may experience short-term financing needs, including those caused by shocks. The SCF supports countries’ economic programs aimed at restoring a sustainable macroeconomic position consistent with strong and durable growth and poverty reduction. (see imf.org/external/np/exr/facts/scf.htm). Freighting numbers from the Bank of Uganda released now right before this election season. Well, we are in the middle of election hiatus and all, the Nomination and planned campaign that last to 18th February 2016. This here will not be on that, but be crunches numbers delivered from the Bank of Uganda Yearly report for the 2014/2015 budget year. This here will tell what I see as important from that report. “The external position weakened with the current account deficit excluding official grants deteriorating to 11 percent of GDP compared to 8,8 percent in 2013/14. The deterioration of the current account deficit was largely driven by the services deficit, which deteriorated to US$ 731 Million in 2014/15 from USD 323 million in 2013/14 mainly account of higher payments of government services related to infrastructure projects, particularly Karuma and Isimba Hydro Power Projects” (BoU P:1). That is big change in deficit! That must be a bit worrying that the amount of monies is becoming this big. Also with the infrastructure projects makes so big hunch of that deficit. Financial risk management at Bank of Uganda focuses on the risk exposures in both the foreign exchange reserves portfolio as well as other operational areas of the Bank. Notably, foreign exchange reserves account for over 86 percent (2014: 74 percent) of BOU’ assets” (BoU, P: 12). A lot of foreign exchange is major parts of the reserves of the bank. Is that a safe way to do it and doesn’t that devalue its own currency? “The higher than programmed expenditure was partly, compensated for by the over performance in government revenue. Total government revenue, including grants amounted to UGX. 10,866.0 Billion, which has higher than target by UGX. 249.1 Billion. Grants and domestic revenues over performed by UGX. 173. 0 Billion, respectably” (BoU, P: 28). The good news is that Government is able to collect more revenue as of taxation and grants to the Government. Though we can say it is a steady rise and the bank doesn’t explain how the rise happen, because this can’t all be collected on the Cellphone, Alcohol or VAT taxes, but something else. “The fiscal deficit of UGX 3,621 Billion was financed by both domestic and external source, which amounted to UGX. 2,479.0 Billion and UGX. 919 billion, respectively. Domestic financing included a drawdown on savings amounting to UGX. 1,060.0 Billion and net issuance of Government securities of UGX. 1,386.0 Billion. The drawdone of savings was specifically used to finance expenditures related to the public infrastructure projects” (BoU, P: 29). This here continues on how the financed and the fiscal deficit and sure the drawdone on the savings to build infrastructure projects. The total public debt stock, in nominal terms, at end June 2015 is estimated at UGX. 24,242.0 billion, an increase of 24,2 percent of UGX. 19.518. 0 Billion at end of June 2014. 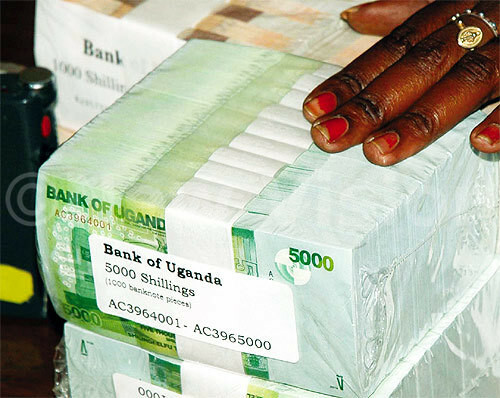 External and domestic debt increased by 27,7 percent and 21,1 percent, respectively” (BoU, P: 29). This here is frightening how much the rise is steady and getting more… The terms of it and the rise should make people shake their heads and worry. The Government of Uganda continues to hedge the Public loans and having a rise like this can’t be a sign of a healthy economy. The depreciation pressures which started in early 2014 continued through June 2015, with the Shilling depreciating by 18,8 percent year-on-year on a trade weighted basis and by 29.1 percent against the USD to an average mid-rate of UGX. 3,398,49 per USD” BoU, P: 31). That the currency loses value towards the dollar should also be worring. When you see how much shillings you need now to get the dollar now. In June 2015, the Government opened two accounts (UGX and USD) in order to operationalize the PF. These accounts are to receive all oil related revenues. In June 2015, USD 36 million was received as part payment of the USD 250 million capital gains tax (CGT) liability from Tullow. This sum includes USD 142 million received in 2012 and USD 108 million to be paid in three equal installments of USD 36 million in 2015, 2016 and 2017” (BoU, P: 45). “During the year, an amount of UGX 1,607,814 million was transferred from the Oil Tax Revenue Fund to Uganda Consolidation Fund. This balance relates to an amount of UGX 1,161,737 million from Tullow Oil paid to GOU for the settlement of tax dispute between the Government and Heritage Oil & Gas (U) Limited. It also includes stamp duty of USD 171 million (UGX 447 million) on sale of Tullow Oil’s assets to Total and CNOOC” (BoU, P: 107). “In addition, the bank received USD 36 million (UGX 119,057 million) on 22 June 2015 on behalf of GoU, relating to Tranche 1 Tullow Oil tax settlement” (BoU P: 107). “Ugandan Consolidation Fund refers to the Government appropriation account where all tax receipts are credited and appropriations made. During 2014/15, UGX 1,612,080 million relating to the oil tax revenue collections was transferred to the UFC” (BoU, P: 107). As seen Petroleum Revenue Investment Fund and Oil Tax revenue shows how the oil impact has on the economy. We can also see the result of the longstanding dispute of the Government of Uganda and Tullow Oil Company. That has now been overturned and gotten the Total and CNOOC. There will be more monies at stake on a later stage coming with the found oil in the Bunyoro area and Lake Albert. “The special loan to government relates to an advance to government for procurement of the presidential aircraft with interest rates (LIBOR plus 100 basis points), maturity date and repayment terms agreed between Ministry of Finance and the Bank as stipulated in the memorandum of understanding. The last loan instalment was paid off on 24 July 2015” (BoU, P: 107). That was an expensive airplane for the president! Though it’s all back-paid this still shows how the President buys what he needs and wants, and not what the people need. 2014 it was UGX 3, 245,961 million. 2015 it was UGX 2, 386,056 million. As proof with the rising debt and deficits, even with rise of higher taxs returns the Government of Uganda. Stills shows that their spending more than they getting since the Taxation fund is dwindling and become less and smaller account. That in total with the other numbers should be a worrying thing to see. Especially knowing how the NRM-Regime goes mayhem on the economy the coming months of elections paying for every votes with chickens and goats in the districts. We have seen that before and will see it again. This will also lead to rise of inflation with more running through the economy so the value of the currency might also dwindle towards on dollar. Wouldn’t be surprised if the Shilling comes up to 4,000 on a dollar! And that is not a good luck, since the imports and prices will rise for the rise of cost of imports. But hope my predictions isn’t correct, but election cycles usual make the ordinary voter pay and those receiving just get a patch on the wound created by the mayhem done to economy by the ruling regime. Peace.